Archbold offers examples of those who have exhibited great forgiveness, loved strangers, trusted God when all the odds were against them, sacrificed themselves in service to others, and showed courage I the faith of great opposition. Each chapter is introduced by a quote from Scripture, contains one profile, and includes discussion questions suitable for private reflection or use in a group setting. 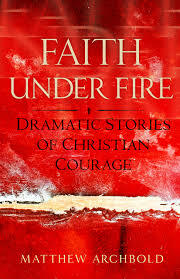 “Faith Under Fire” offers powerful examples of how to live. Those of us who read it can only hope and pray that if put to the test in such a fashion, we would respond with the same inspiring level of courage and love. 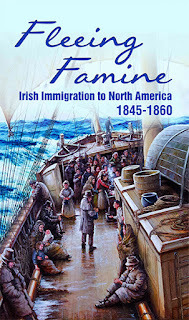 From 1845 to 1860, more than 1.5 million Irish immigrants sailed across the Atlantic Ocean to the United States and Canada. In the cramped quarters below the decks of the "coffin ships," the journey was fraught with the hardship of inclement weather and the peril of disease, but in spite of their uncertain future, the travelers faced these adversities in hopes of finding a better way of life in North America. 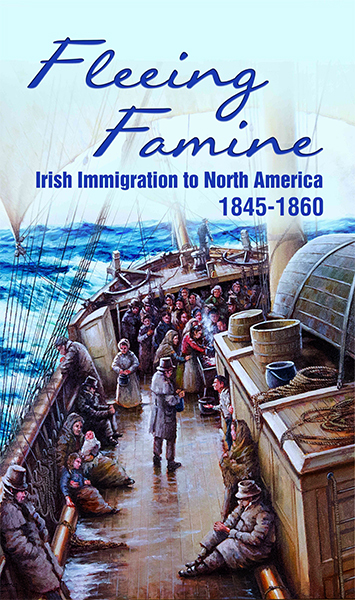 Fleeing Famine recounts the harrowing experience of the 3,000-mile journey, offering visitors insight into conditions aboard the crowded ships. Enjoy Catholic Science Fiction? Today I'm pleased to be the blog tour stop for Discovery by Karina Fabian. Sisters Ann, Tommie and Rita are part of a classified mission to explore an alien ship that has crash landed on an asteroid three billion miles from earth. Humanity's first contact with beings from beyond the solar system is bound to unlock the mystery of life in the universe, but the crew have their own secrets; hidden fears, desires, horrible sins - and a mission to kill. Researchers discover something unique about the third arm of the ship: something wonderful, terrifying and...holy. This discovery challenges Rita and Ann to confront their own pasts in order to secure the safety of the mission and the very souls of the crew. Augustus laughed and put a friendly arm around James' shoulder, leading him down to the ship's offices. He said nothing more until they got to the conference room. He held the door open for James, and when they had stepped through, announced, "Gentlemen, I'd like you to meet Dr. James Smith. He thinks I want him to find Atlantis." Two men sat at the table. The younger dressed in jeans and a gray collared shirt with the Luna Technological University logo over the pocket; his mousy brown hair and pale brown eyes combined with a tense, nervous posture reminded James of many worried grad students he had known. The older, a fifty-something man dressed in a similar shirt but with tweed pants, nodded James' way. His relaxed full-throated chuckle was for Cole's benefit. Augustus continued, "James, this is Dr. William Thoren, Dean of Astrophysics at LunaTech, and this is Chris Davidson." "My protégé," Thoren added when Augustus paused. The entrepreneur's eyes flicked in annoyance. He hated having his dramatic moments spoiled. Nonetheless, he continued on as if the dean had not spoken. "Chris has been working on a rather uninspiring project for his doctorate that has had a surprising result. But wait!" With that impish grin, he reached into his pockets and pulled out four small devices, which he set at four points of the room. When he pressed the remote in his hand, they heard a brief hum, then a shimmery fog formed a dome over them. No one outside the dome would be able to hear them and would only see vague shapes. Scientists from the moon? Security fields? Well, if Augustus wants my attention, he's got it. James took a seat at the table, and cocked a brow at Augustus. "So you've found the Lost City of Atlantis in space?" "Close, my friend. Close. Chris?" Chris gave a brief glance at his supervisor, and Thoren nodded in a benign, "carry on." He pulled out a handheld computer, set it on the small table, and pressed some buttons. A holographic map of the solar system from the Sun to the asteroid belt appeared, beautifully detailed and large enough that James had to sit back a bit. "Sir, are you familiar with the Kuiper Belt?" Chris asked. James shrugged. What's going on? "Ky-per Belt? That's not like the asteroid belt?" "This is the asteroid belt." Chris set his finger on the thin line of rocks just past Mars' orbit. He slowly pulled his finger toward himself. As he did, planets rushed past James' field of vision: Jupiter, Saturn, Uranus, Neptune, Pluto. A moment of black space, then the image stopped at a smattering of dots of various sizes. "This is the Kuiper Belt. K-U-I-P-E-R, even though it’s pronounced ‘Kyper.’ It's really just the rubble left over from the formation of the solar system. Most of it isn't even rock, but ice. Comets come from here. We don't hear much about it because the distances even from the Outer Planets mean it's not really cost effective to live or work there. And since the commercialization of space, most people don't even care…"
"Excuse me, Chris, but why am I getting an astronomy lesson?" The entrepreneur grinned. "Give him a minute." He jerked his head encouragingly at the grad student, who gave him a shy smile in return. From the corner of his eye, James saw Thoren glower; then, the expression was smoothed away. Chris didn't notice. "Okay, the last time anyone has bothered to explore the Kuiper Belt was with the Seeker Probe of 2215. The American President, Linda Montero-Fadil, pretty much pushed it through on personality and stubbornness, but they called it Fadil's Folly…” Thoren cleared his throat. "Anyway!" Chris started, then floundered a moment, his train of thought derailed. He took a breath, touched an area of the map with two fingers and pulled it apart, expanding that area. He did it again and again, then rotated it and circled an object with a dark center. The rest of the map fell away. "This is 2217RB86. Seeker did a flyby of it and its neighboring objects. That's what you call, um, objects in the Kuiper Belt. Or Ky-boes. That's what we call them at the university. So, this Ky-bo caught my attention because it's got some very unusual readings, especially around this dark dot... I won't bore you with the details. 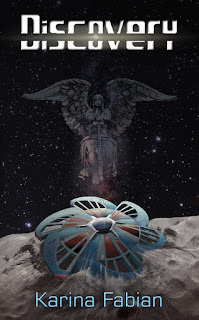 The point is, Dr. Thoren was able to get us some time on Old COOT — that's a telescope on L5 Station - and um…" He stopped to glance around, as if making sure the security field was still in place. Then he pressed another button and pulled up a different, sharper image of the Ky-bo. "Oh, my." James leaned forward, his nose only inches from the image. The dark circle had resolved into six crescent arms jutting from a sphere. One arm was partially dug into the rock. "He didn't find Atlantis," Augustus smirked.